Buy your tickets for the Backstreet Boys online today. Save more and get the best price with online purchase. Be sure to compare all offers AFTER taxes and fees to get the best rates. Backstreets back alright! This concert at the famous Planet Hollywood Resort & Casino is your chance to see the Backstreet Boys live! 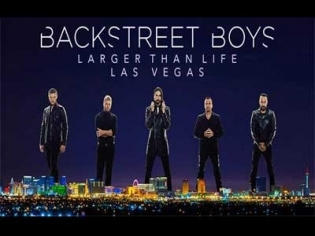 Backstreet Boys: Larger Than Life is a celebration of their biggest hits from their best selling albums. Book online to snag a seat. Prices start as low as $80! The Backstreet Boys take over Las Vegas with an over-the-top, one-of-a-kind production made exclusively for the Las Vegas stage. This is more than a concert; with this intimate venue the group connects with their fans in a celebration. The biggest boy band in the world is all grown up and 24 years later is performing in their first residency on the Las Vegas Strip. The show has a 20-song roster that every Backstreet Boys fan will recognize. The iconic singles bring things back to where it all began. Enjoy the title song “Larger than Life” and “The One” from the Millennium album and then dive back to 1996 with “Quit Playin’ Games.” This is a more intimate, yet more staged show than ever performed on their concert tours. Complete with back up dancers, light shows and even performances from within the audience, the guys nostalgically dance some of the original choreography from their oldest tunes. Nick Carter, Howie Dorough, Brian Littrell, AJ McLean and Kevin Richardson take the stage captivating their fans in a can’t-miss concert event! This residency is a limited event, so make your plans now! Last scheduled show is April 2019.